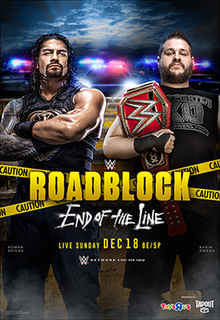 WWE Roadblock End of the Line, the final RAW PPV of the year, will be taking place at the PPG Paints Arena in Pittsburgh. WWE TLC was pretty good so will Roadblock follow in that suit? Let's take a look. I feel that Rusev, who is somehow the heel in this, will win here. This is one that I'm really looking forward to and it's a tough one to call. I feel that Rollins might just win this. This match has a 10 minute time limit but I don't think it will last that long. I'm going for Strowman to win. This feud, except for hot potato title changes, has been enjoyable and I really want Sasha. However, Charlotte is undefeated in PPV matches and I feel that WWE will continue in that vein. This could be a good match between the two. I feel that Jericho will come in to help Owens win.